This is the 51st in a series of posts on the Fujifilm GFX-50S. The series starts here. I am reading many complaints about photographers who are having difficulty in manually focusing the Fuji GFX, both with the native focus-by-wire lenses and adapted ones. I have developed what I think are highly accurate ways to focus the camera. I have touched on them in this post about GFX focusing in general, but the thrust of that piece was about autofocus. Today I’m going to concentrate on manual focus, with the aim of guiding GFX users to satisfaction with their ability to focus accurately. Notice that I am not aiming for “delight”. Let’s back up and talk about manual focusing for digital cameras in general. Early digital cameras were either modified film SLR bodies (thank you, Eastman Kodak) or scanning inserts for 4×5 view or press cameras (now called technical cameras). Manual focusing was no better and no worse than on the film cameras themselves. We used loupes on the ground glass of the view cameras, and that was only fairly successful; stopping down a lot covered up our errors, and the slow lenses we used didn’t have bad focus shift. For the film cameras, it was worse, since by that time the manual focusing aids formerly employed in film SLRs were being phased out on the mistaken theory that, thanks to autofocus, they were superfluous. Then came medium format SLRs, and manual focusing became a real problem. Ten or more years ago, salvation appeared in the form of live view. 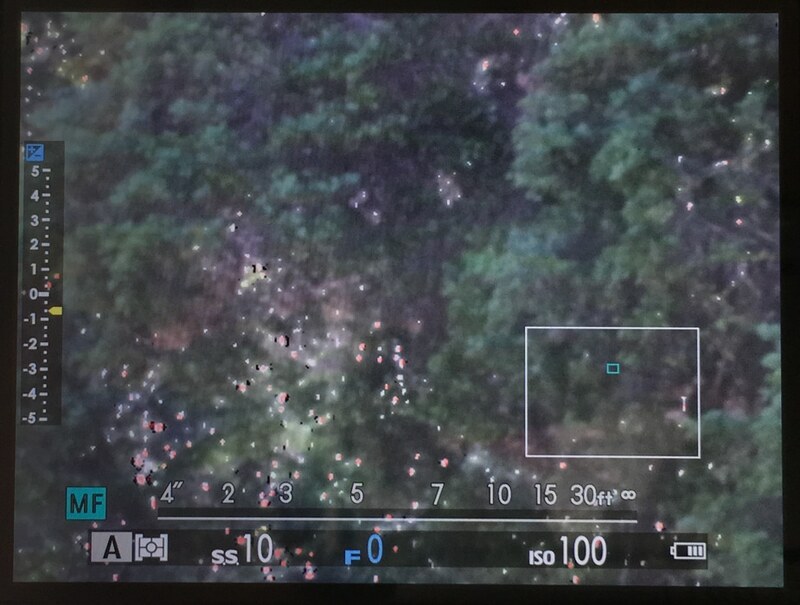 Now we were back to peering at the back of the camera, only at a much smaller display than with a view camera. The image was right-side-up, but some of us still longed for dark cloths. 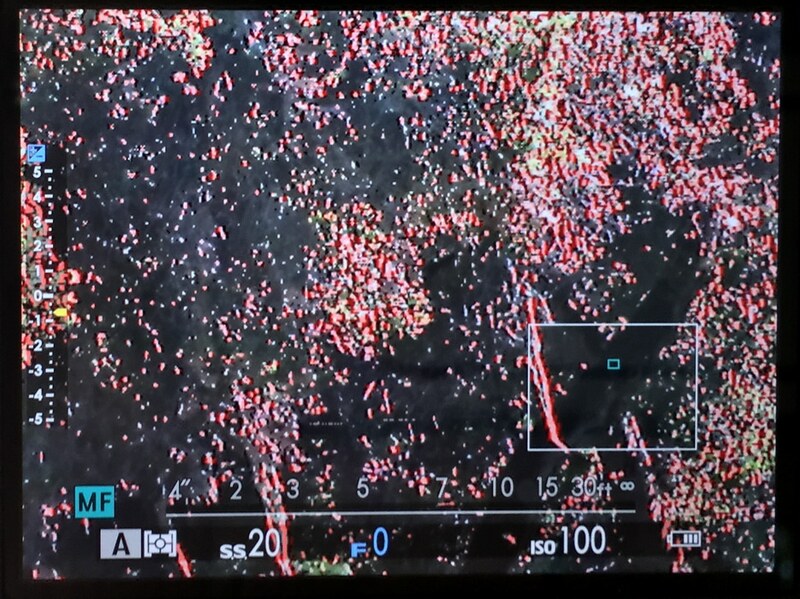 There was one really good thing: we could magnify the image digitally, in some cases to a sensor pixel level. We could finally have high-resolution, sharp, manually focused digital images. Over the years, live view became ubiquitous on high-end DSLRs; it even appeared in medium format, with the arrival of CMOS to that size sensor. 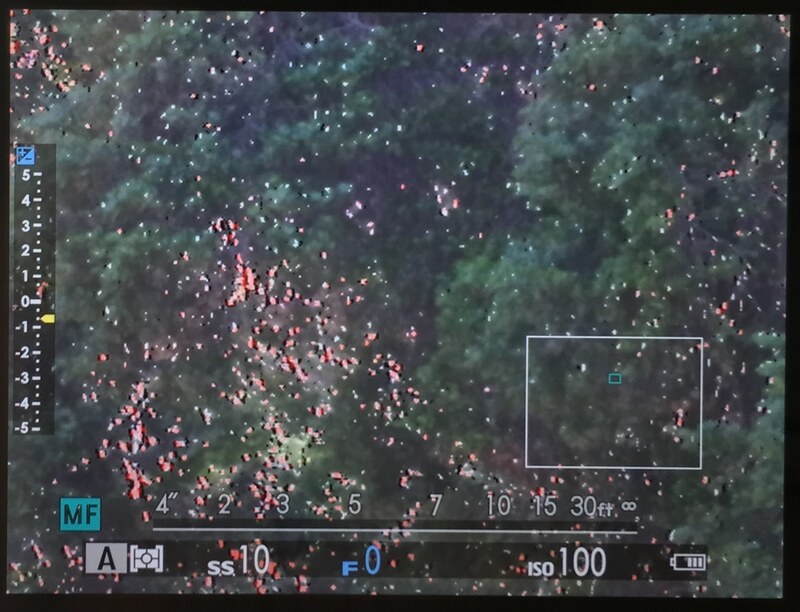 Then came mirrorless, which put live view in the viewfinder. 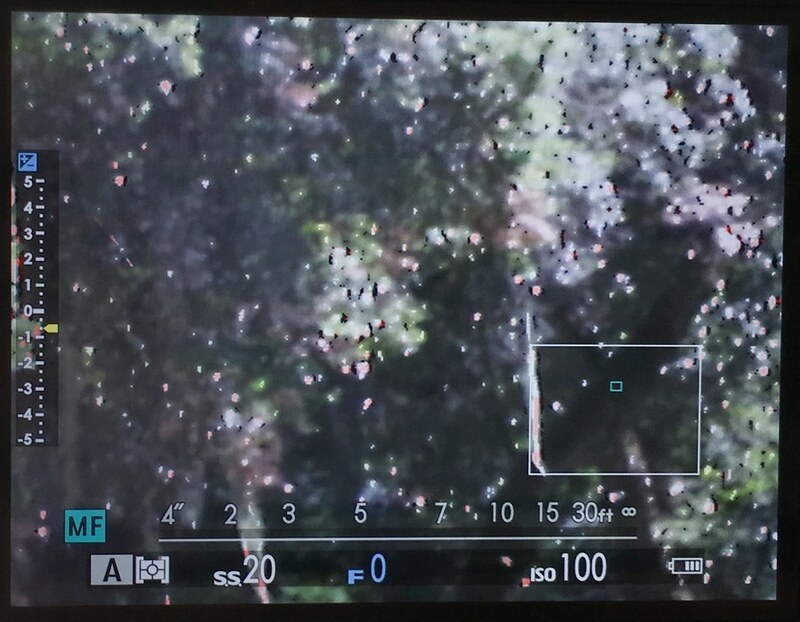 Because of that and IBIS, we finally had the ability to accurately focus manually with the camera handheld. 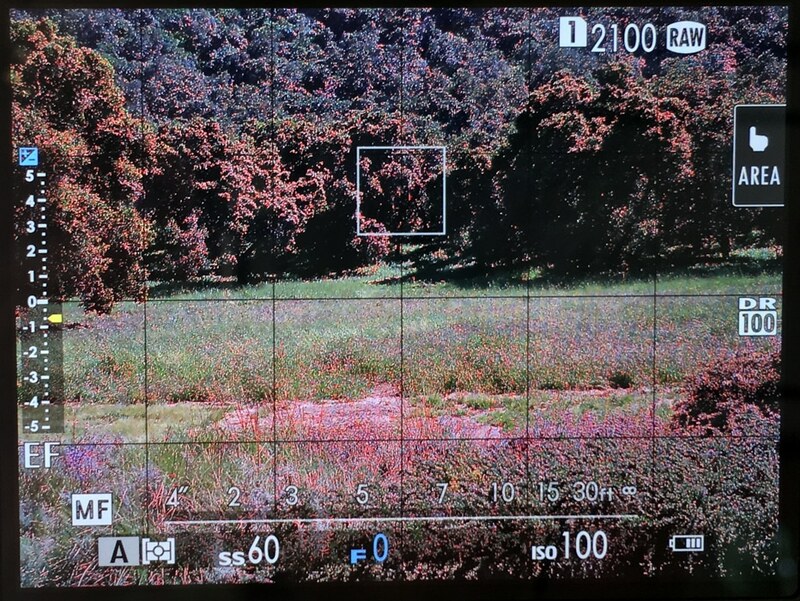 With mirrorless came a focusing aid called peaking, which added false color to the viewfinder in places where horizontal scans showed a lot of contrast. Most people used peaking when looking at a full frame image, where it proved to be useful for judging depth of field in some circumstances, but was too much of a blunt instrument for critically focusing. For that reason, focus peaking acquired a bad reputation among photographers who wanted sharp images. GFX with peaking set to “Low”, focused on the distant trees. Notice how everything is lit up in red including the OOF foreground. Useless. When magnified finders were good, as they were in the D810 (not the D800), the a7II, and the a7RII (and, even better, the a7R) they were good enough that you didn’t need to use peaking in magnified view, which reinforced the viewpoint that peaking was for people who just wanted to get close to the right focus. Then, the GFX showed up. It had three focus magnification settings, easily controlled by a thumb wheel. Good. But the most magnified setting was too low for critical work. Not so good. And so people started saying that you can’t focus a GFX accurately. That would be true, if it weren’t for peaking. Here’s the way that focus peaking and magnification interact. As you increase the magnification, you need more peaking sensitivity to light up the same parts of the image. Looked at another way, the peaking setting that’s right for a heavily magnified image is too sensitive for one with less magnification. Fuji has two peaking sensitivities in the GFX, not including off. They call them low and high. I call them high and higher, but for this post, we’ll stick to Fuji’s terminology. What follows is my advice on how to focus the GFX with good-quality lenses with the camera on a tripod. First, ignore the two lower settings for magnified view. You only care about full frame view and the most magnified one. Second, turn focus peaking on, and set it to something other than white; I like red, and I’ll assume you picked that for the rest of this piece. Set the lens to the taking aperture unless you’ve determined that focus shift isn’t going to be a problem. You can split the difference and, say, focus at f/4 and shoot at f/8 if you have determined that that’s safe. Unless your subject is very low in contrast, the peaking setting that Fuji calls high is going to be too high, so try the one they call low first. Now focus on whatever you want. There are three things that can happen. The first is that nothing lights up in red. In that unlikely case, increase the sensitivity to high, and try again. The second is that too much of the image lights up for you to find the critical focus point. In that case, find a part of your subject that is lower in contrast. If you look hard, you can almost always find something suitable. The third is that you’ve found a part of the subject where there’s a little red at the focus point, but not too much. Even better is a part of the subject that shows little white dots just off the focus point, and tinges of red right at it. That makes it really easy to focus. That’s pretty much it. I encourage you to experiment. The camera is good enough and sharp enough that it deserves to be focused accurately. Max magnification, peaking set to red and low. Image is OOF. Note just a few white dots. Max magnification, peaking set to red and low. Not in focus. Mixed white and red dots. Max magnification, peaking set to red and low. In focus. Lots of red. This is an example of an area of the subject with marginally too much contrast. Max magnification, peaking set to red and low. Switching to a lower-contrast part of the subject. Out of focus. Max magnification, peaking set to red and low. In focus. The transition to this many red dots is quite abrupt. Note that you are now focusing on a part of the subject that you wouldn’t use if it weren’t for peaking. There’s another trick to peaking. It’s based on horizontal scan lines, so, when faced with a subject with vertically or horizontally oriented structure (or anything in between), you can vary the camera’s peaking sensitivity by rotating it. If the lines in the target line up vertically in the (landscape oriented) finder, you’re going to have the greatest peaking sensitivity, if they line up horizontally, your sensitivity will be the least. Up above I said that “delight” was an unrealistic expectation for the GFX focusing experience. 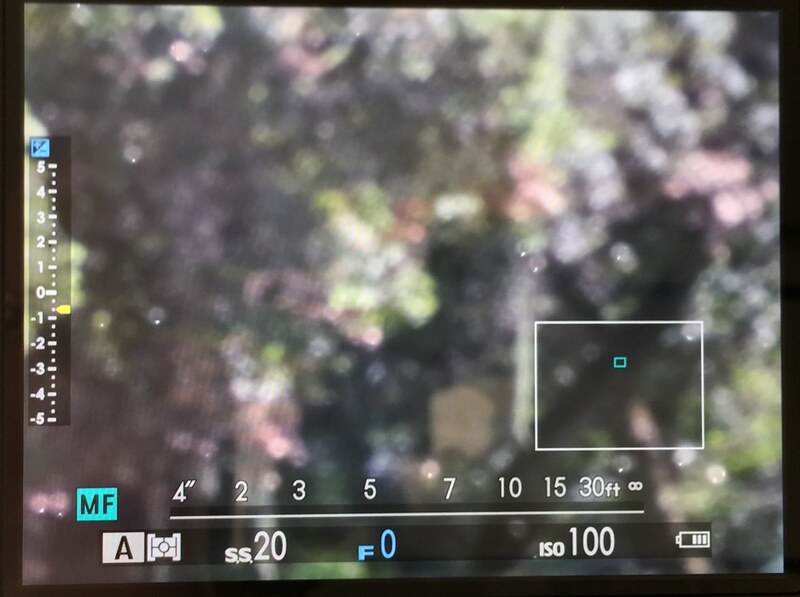 I think it’s unrealistic for any manual focusing experience today, save the Betterlight Super 6K, the special focusing target, and the app set to focus mode (and even that has a ugly side in that you need to put the focusing target in the scene to make it work, and it won’t work if the focusing target is far away). More magnification at all three settings. Continuously variable peaking sensitivity adjustable with a thumbwheel, going much lower than the present “low” setting. Many of your posts have been helpful. Still waiting on my fuji lens so I’ve been struggling with my nikom lenses to accurate focus. Coming from a d810 and ovf, I find the gfx very different and not as easy. Have you found any way to change the shutter dial on the back from 1/3 to 1/2 or 1? I can’t seem to get the exposure meter to react as senstively, as I can my d810. It jumps in increments as I massively swipe the back dial! I don’t use the exposure meter in manual mode. I haven’t talked about this in the blog yet, but one of the things that I think is so great about the GFX is having a color livve histogram available at the touch of a button. i don’t know of any other camera that has this — I’ve never used the APS-C Fujis. It is so much better than an exposure meter for setting manual exposure. Sure, it’s not a real raw histogram, but it’s pretty darned good. The dial adjusts shutter speeds in 1/3 stop increments. If you want whole stop increments, just use the big dial on the top of the camera. Where’s Peaking in the menu listing? It doesn’t appear in the tables at the front of the manual. Peaking is to be found under MF > MF Assist. This isn’t intuitive, because Focus Assist usually refers to a light beam that aids focusing. This is one of the little problems that arises because there’s no index in the manual. The other getting-started problems I’ve had trouble with are the eccentric Fuji vocabulary, with Photometry meaning Metering Mode, and ISO disguised as Sensitivity. Oh – and M on the upper left rear dial means Manual, not Movie! I agree about the index. I didn’t have any trouble with the Fuji terminology for peaking, because there is no place for a light source on the front of the camera. I didn’t have any trouble with Photometry, either, since it means exactly what it sounds like it would mean, although I did and do find it a little quaint. And I think sensitivity is a much better name than ISO. In my book, gain would be even better. And I never even considered that M on a dial with S and C as the other positions, could possible be movie. Thanks for the piece Jim! Not sure if I follow this: the a7R3 has a maximum magnification of 12x (not sure if a7R offers higher? ), which is lower than the max GFX offers (16x). I stand corrected, and I’ll make the change. Not sure why the a7R was easier to focus without peaking. A probably dated reply, but I did find the magnified view on GFX is lagging behind the a7R3. In fact, of all the recent cameras I’ve used, the live view on 5DsR provided the best magnified manual focusing experience, it was just so easy to see when things are in focus. Also the 5DsR provides more fine grained control when moving the focus point. GFX’s magnified view OTOH, just doesn’t seem to have shallow enough DOF to reach focus quickly. That leaves me wonder, is it because the GFX doesn’t open up the aperture automatically when focusing (like DSLRs)? You are correct, without peaking. My point is that, with peaking, it is fast and accurate.